External hard drives seem to flood the market these days, but how many come with an automatic backup utility? 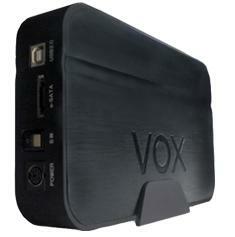 A company that I was previously unfamiliar with, VOX, has sent in a sample of their V1 External Hard Drive. The V1 is an external enclosure with a choice of hard drive capacity, the choices being 250GB, 500GB, or 750GB. Specifically, the sample I have received is of the 500GB variant. The interesting aspect is the one-button backup utility, which if coupled with a competitive price, will be very intriguing to a number of end users. At first glance, I see that the casing is metallic, as opposed to plastic like most other hard drive enclosures I've seen. There is one thing that has always peeved me in regards to a new, innovative product - finding that it is made of a flimsy material that snaps apart within a month (even though I tend to treat my toys as if they were newborn babies). It is noticeably heavier than other external hard drives, and much more durable. The accessories include the power cord, USB/e-SATA cords, driver/software CD, and optional stand to support the hard drive upright. Of note, the power plug (shown in the left-most picture below), is known to become loose over time if the drive is thrown around with the jack attached. Just be cautious and you should not encounter problems with this. Dimensions (WxHxD in. ).....................10" x 3.5" x 12.5"